When I was eleven, my friends and I made a Super-8 knock-off of Star Wars that we creatively entitled “Galactic Wars”. It had a “cantina” scene, aliens made with papier-mâché masks, spaceships, and a light saber duel that looked surprisingly good. We entered it into a film contest hosted by CineMagic magazine and received honorable mention. Since my friend’s older brother directed, he got his name published in the magazine. It was a big deal for us. We didn’t directly make a Star Wars movie, and even at that young age we were smart enough to know that it wouldn’t be a good idea to try to copy the characters and plot directly—so in classic Hollywood tradition we just ripped it off. However, the urge was there to do our own version of a movie we loved. We wanted to do our own Jaws film and even went so far as to build a fake shark, which was ruined when it was left out in the rain. I guess we didn’t think that one through very thoroughly. Also, being a huge fan of M*A*S*H in every incarnation (TV series, movie, novel, and even the obscure play), I wanted to do my own version of that. I wrote a script and tried to figure out how to recreate the 4077th. A neighbor had a Jeep, so that was a start. But that film never came to fruition, as my family moved away before I had a chance to actually do anything on it. It then occurred to me that I was attempting to do a random episode of the TV show when I should have gone back to the source, so I wrote a second script—this one based directly on the book. I did my own adaptation that shared some similarities with the feature film, yet was my own take on that story. Again, this never got made since the scope of the project was too large for a twelve-year-old. I understand that desire to do your own telling of a beloved story. Sometimes fictional worlds seem so real that the characters are like your friends, and with some people there is an urge to not only be a passive observer but to interact with that fiction in a more active role and have control over the characters and plots. In other words, they no longer want to be the audience, but the creator. The problem is that when I was experiencing this, I was a child; now there are adults who are doing exactly the same. With the advance in technology, we have seen the advent of so-called “fan films”, which are re-tellings of favorite shows done on low or no budget made by people who love the original and want to add their own stamp to these movies. While their written-word fan fiction counterparts flourish mostly on websites that often exist on the fringes of the Internet, fan films can be found aplenty on YouTube. 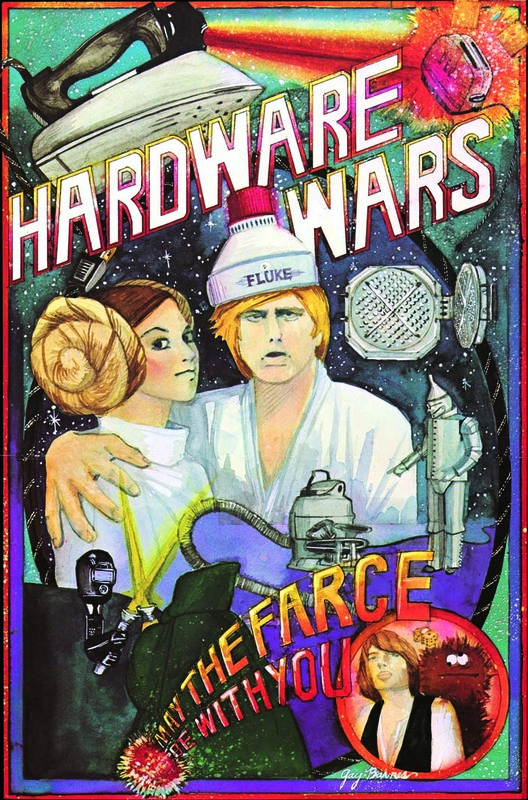 Probably the earliest variation of a fan film came in the form of another Super-8 movie made a year before we did our nearly-award-winning attempt—”Hardware Wars“, a parody of Star Wars directed by Ernie Fosselius using household appliances in place of the futuristic “hardware” found in George Lucas’s epic. Even before the days of the Internet, this short found great fame through screenings at film festivals and runs in theaters, earning $1,000,000. It was released on video in a compilation of other short parodies, including another one made by Fosselius that skewered Apocalypse Now called “Porklips Now“. As costly Super-8 film was pushed out of use by easy-to-use (yet still very expensive at the time) VHS cameras, home filmmaking became a more popular past time, especially with young wanna-be filmmakers. Of course, kids naturally gravitated to remaking the movies that thrilled them. The most famous (at least now) of these is a shot-for-shot recreation of Raiders of the Lost Ark made by a group of teenage boys that was produced over the course of several years. They’re now peddling a documentary about their efforts called Raiders! : The Story of the Greatest Fan Film Ever Made. By the time the Internet was a real thing, cameras and editing capabilities reached a point where filmmakers could do inexpensive productions and distribute it for the world to see. Almost as quickly, fan films began to proliferate the bandwidth. One of the earliest Internet sensations of this ilk was “TROOPS“, which used familiar characters and settings from Star Wars in a situation like in the TV series COPS. As with “Hardware Wars”, this was made with the intent to satirize the source material, not just copy it. However, more fan films surfaced that were legitimately trying to do a serious take on the original properties. For instance, “Batman: Dead End” and “Grayson” both had high production value and existed in the universe of the Dark Knight, though featured elements that had never been seen in official Batman productions. In the case of the former, it introduced the Caped Crusader to characters outside of DC Comics—the xenomorph from Alien and Predator. With the latter, it was spotlighting Robin, making him the lead of his own story rather than simply a sidekick (though it was done in the form of a trailer for a feature film). Both of these films were essentially a fan wish fulfillment of stories that would probably never be made by studios. The history of fan films was covered expertly and entertainingly in Backyard Blockbusters by John Hudgens. The infatuation with making fan films came as no surprise to me, because I saw much of this when I was in film school right at the cusp of the digital revolution. Fellow students made their own versions of Indiana Jones, Batman, and Predator, among others. I actually participated in several of these, acting as Joker in a class project that used a scene from a rejected draft of Tim Burton’s Batman as well as both acting in and assisting to edit a Predator project. In both these cases, the directors did not intend for their work to be seen outside the classroom, so they were just having fun with an assignment that was shot on video. But others were serious with their ventures by shooting on expensive 16mm film and putting actual production value into these shorts. For instance, I starred in an adaptation of the classic comic book The Shadow as both the lead character and the villain (it was interesting when both characters had to sword-fight each other). This was a trailer for a proposed feature film that my friend was serious about pursuing. Unfortunately, while we were shooting this, Universal announced that it was producing its own big-budget version starring Alec Baldwin, squashing my friend’s hopes of getting his own (and in my opinion superior) project made. Therein lies the basic problem with fan films—copyright. My friend didn’t own the rights to the character of The Shadow, so his film ended up being a costly class project, just like the others made from properties the students didn’t own. The same goes for every fan film that’s still made. Early on, the studios that owned the copyrights attempted to shut down any release of fan films. However, Lucasfilm led the way with allowing them and even promoted a contest for Star Wars fan films. They realized that preventing fans from expressing their love of this material was doing more damage than copyright infringement was, and the proliferation of fan films was free promotion of their properties. So other studios essentially followed Lucasfilm’s lead by unofficially allowing fan films to be produced and distributed online as long as no money was made off them. This gave the filmmakers an outlet to explore these established universes and allowed audiences to experience something other than the official releases, especially if there was a drought of material—as in the case of the years when no variation of Star Trek was in production. After Enterprise was cancelled and before J.J. Abrams’s reboot hit the theaters, there was a void in the lives of Trek enthusiasts that was filled with such online productions as Star Trek: New Voyages (AKA Phase II, named after the aborted 1970s TV series that morphed into Star Trek: The Motion Picture) that actually used scripts by professional Trek writers such as David Gerrold, Dorothy Fontana, and Marc Scott Zicree as well as casting original Trek actors like George Takei and Walter Koenig. Most recently, there have been attempts to crowdfunding projects with larger scopes and budgets such as Star Trek Continues, Star Trek: Renegades and Axanar. It was Axanar that recently caused a stir in the Force (whoops, wrong franchise) and angered CBS and Paramount so much that a law suit ensued. This was due to the producers of Axanar (a proposed studio-quality feature film with name actors starring in it) raising $1,000,000 on Kickstarter to pay for the production. This ran contrary to their policy of overlooking fan films as long as no money was made on it. Paramount’s stance is that even though the million bucks raised was to go toward production costs, it still violated that policy and the producers were making money on property that Paramount owned. The most recent twist is that CBS and Paramount announced new rules regarding Star Trek fan films, which effectively puts an end to those productions that want to be more than an amateur cheese-fest because not only does it prevent them from raising money to afford high quality sets and special effects, but it also bars any cast or crew who has ever professionally worked for any incarnation of Star Trek from participating in these programs (and actually, any professional, as they expect the fan film to be an amateur production). The producers of Renegades has a solution to that—it will change the story of their upcoming episode “The Requiem” to be original and not be connected to the Star Trek universe. Which in my opinion is a good thing. My position, even back in my film school days, was that if you’re going to spend all the time, effort, and money to make a film, then do something original. By producing your own version of an established property, all you’re doing is making a copy, no matter how well it turns out. If you’re a creative entity, then create your own material. Granted, not everyone is a writer and ideas are often hard to come by. This is the reason why Stephen King started his Dollar Babies program, where filmmakers can option the rights to certain of his stories for one dollar to make into short films; but much like Paramount’s new rules, it has restrictions such as limiting distribution to only film festivals and posting no more than two minutes of the footage online. In essence, this gives filmmakers the ability to legally make a movie based on a Stephen King short story and use it to win awards or to show on a demo reel, but not make money off it. Let’s face it, despite the unlikely success of “Hardware Wars”, no one’s going to make money off a short film. I should know, as I’ve done a number of them myself. The most a beginning filmmaker can hope for is that someone will take notice of his work and offer him a job based on it or the possibility of a short being expanded into a feature. However, the producers of the Star Trek fan films have a different goal—they want to expand the Trek universe and keep stories alive for the benefit of other fans, not just themselves. This seems to be a fairly righteous approach to take, except for one pesky fact that the Renegades team refers to as CBS and Paramount allowing them to “play in their proverbial sandbox”. The sandbox is jointly owned by those two companies (which have a long, twisting history). Even though this upsets some fans, who often have a sense of ownership over their fandoms (a phenomenon I’ve written about). The fact remains that legally, whoever owns the copyright is the only one who can do anything with that property, and once they give up those rights it’s hard to reclaim them. That’s why Disney jealously protects their characters. You can call it greed, but that’s the reality of business. If Lucasfilm or Warner Bros. or Paramount want to be strict regarding fan films and send Cease and Desist notices to remove every one of them from the Internet, that’s their prerogative, regardless of the public relations headache it may cause. The Star Trek rules still allow fan films to be made, but under their guidelines. I won’t be surprised if other studios follow suit. I’ve had my own dealings with rights issues. My co-writer, Lee Shapiro, and I once wanted to adapt the John Wyndham novel Day of the Triffids into a screenplay that we were going to pitch to Universal Studios. We finally tracked down the person who owned the rights—a week before our meeting with Universal—only to be told that he was not interested in teaming with us. So we had to revise our concept and quickly came up with an original idea that shared some similarities in the basic premise with the Wyndham book. Hence From the Ashes was born (unfortunately, to date only a short was produced from this screenplay). Lee and I also pitched an idea for a Batman movie to Warner Bros. and only wrote it after the Vice President of WB, Tom Lassally, requested to read it. After two years, the studio finally decided to pass on Batman: DarKnight and go in a different direction. We’ve recently made it available in a published form after numerous websites have listed it among the best unproduced Batman scripts. The point is that this was not fan fiction, but a legitimate studio project, and the list price on Amazon pretty much just covers the cost of printing. We never would have written it if it had not been officially sanctioned, and we’re not looking to profit from it now. Copyright is a tricky thing. There is such a thing as Fair Use, which allows certain circumstance where a person can use material owned by someone else. Parody, for instance, is covered—which would involve productions such as “Hardware Wars” and “TROOPS” (as well as my own bit of fun-making at the expense of COPS). Anytime you venture into the sandbox created by someone else, you’re taking the chance that the owner doesn’t want you to play there, regardless of how noble your intentions. From the standpoint of content creators, would you want someone to help themselves to something you originated without first asking permission? Making a fan film of Star Wars or Star Trek or any other famous material might get you noticed, but it’s always best to explore those new worlds and new civilizations yourself without relying on the work that others did before you. Be creative and be original.